Early on the morning of February 5th, 1865, 150 years ago today, David McM. Gregg’s Union cavalry division started moving out from its camps, headed for Dinwiddie Court House looking for a chance to bag Confederate wagon trains hauling supplies from the Weldon Railroad terminus at Belfield and the Confederate lines near Petersburg. On February 4, 1865, a day earlier, Ulysses S. Grant and George G. Meade had finalized a plan to send Gregg’s cavalry on this raid while also keeping two Union corps within supporting distance of the Yankee troopers. Essentially, drawing a straight line to the southwest from Fort cummings, the II Corps would block the Confederates at Armstrong’s Mill and the Vaughan Road crossing of Hatcher’s Run, while V Corps would extend further south and west to provide a safety net for Gregg’s Cavalry during its raid. The plan would be tested on February 5, resulting in a first day of fighting in what would become known as The Battle of Hatcher’s Run, or Dabney’s Mill. Gregg’s Cavalry, after detaching portions of two regiments to act as screens for the II Corps and V Corps, respectively, moved out of their camps at 3 a.m. down the Jerusalem Plank Road to Gary’s Church, and then on to Ream’s Station. The 2nd Brigade led the way, followed by 3rd Brigade, the ambulances, and the 1st Brigade bringing up the rear. Forage for the division’s horses would travel in wagons accompanying Warren’s V Corps for protection. The Union troopers moved south down Jerusalem Plank Road, then on to Gary’s Church, and finally to Ream’s Station. From that point, they moved west on Dinwiddie Court House by the “military” and Vaughan Roads, staying south of Great Cat-tail Creek. Once Gregg’s division reached Dinwiddie Court House, they fanned out in multiple directions. The 8th Pennsylvania Cavalry and 16th Pennsylvania Cavalry moved north and south on the Boydton Plank Road as far as Gravelly Run and just beyond Butterwood Creek, capturing 18 wagons and 50 prisoners, including a colonel and three other commissioned officers. Thirteen of these wagons were from Bushrod Johnson’s Division. The 2nd Pennsylvania Cavalry scouted out the Stony Creek Station Road as well. Gregg heard from prisoners that a Confederate infantry division located four miles north of Dinwiddie Court House had retreated into the main Confederate lines near Burgess Mill. After finding nothing more in the way of Confederate supply wagons ripe for the picking, Gregg headed east again the way he came, headed for Malone’s Crossing of Rowanty Creek. The expected haul Grant was hoping to find had not panned out. Now the cavalry needed to get safely back to Warren’s V Corps, which had moved like an outstretched hand to provide protection for the cavalry. Warren’s V Corps got started at 7 am, as ordered, Ayres’ Division leading the way, followed by Griffin, three batteries of artillery twelve guns in all, and Crawford’s Division, with the ambulances and reserve ammunition wagons bringing up the rear. Three squadrons of the 6th Ohio Cavalry under Captain Saxon provided a screen for the infantry on the march. By 10 am, the leading elements of V Corps had reached Monk’s Neck Bridge near the W. Perkins House on Rowanty Creek, just south of where Hatcher’s Run and Gravelly Run converge to form that larger stream. Movements of Fifth Corps, Feb. 5-8, 1865. The first day’s movements are on the southern portion of the map. The cavalry being unable to overcome the opposition made by the enemy at Rowanty Creek, the One hundred and ninetieth and One hundred and ninety-first Pennsylvania Volunteers were advanced as skirmishers, supported by Fourth Delaware Volunteers, and ordered to take the works beyond the creek. The other regiments of brigade were also brought up. But few men could get across, as the bridge was destroyed. These few, however, succeeded in dislodging the enemy and capturing a few prisoners. After a short delay, to cover the crossing of remainder of division, the brigade again advanced some three or four miles and took up position before dark on the left of Second Brigade. Griffin is at J. Hargrave’s. However, by this point in the day, Humphreys’ II Corps had fought off an attack north of Hatcher’s Run, and Army of the Potomac commander George G. Meade wanted the disparate elements of his command in closer supporting distance, fearing a disaster. Accordingly, he ordered Warren to move northeast up the Vaughan Road to the point where it crossed Hatcher’s Run with V Corps and Gregg’s Cavalry, taking over the defense of the south side of the run from Mott’s Division of the II Corps. In addition, he was to send one of his three divisions north of the run to give Humphreys support. By midnight, V Corps was finally on the march, trying to move closer to II Corps, still holding the crossings of Hatcher’s Run at Armstrong’s Mill and at the Vaughan Road. It had been a busy day for II Corps. Like Warren, Humphreys and his men started at 7 am, moving southwest down the Vaughan Road in the direction of Hatcher’s Run. Humphreys had been ordered by Meade to take control of the crossings of the run at Armstrong’s Mill and at Vaughan Road using two divisions of his II Corps under Smyth and Mott. Essentially, he was to act as a blocking force, preventing the Confederates from using the Vaughan Road to go after Gregg’s cavalry raiders and Warren’s supporting infantry. Before the day was over, he would indeed do some blocking. Humphreys had been sent 220 men of the 3rd Pennsylvania Cavalry under Major Hess to act as his screening force. They were to prevent the enemy videttes from discovering the large infantry force following just behind. Behind the cavalry screen, Humphreys took Smyth’s Second Division (4,607 officers men), Mott’s Third Division (5,961 officers and men), Battery K, 4th U.S. Artillery under Bvt. Captain Roder, and the 10th Massachusetts Artillery under Lieutenant J. W. Adams. Major Hess’ cavalry reached the Vaughan Road crossing of Hatcher’s Run around 9 am, finding Confederates on the southwest bank and the stream “damned and obstructed by fallen trees.” De Trobriand’s Brigade of Mott’s Division soon arrived, driving the Confederates across the run and securing the key position for the Union army. De Trobriand was soon across the stream, probably by 9:45, and covered Vaughan Road while extending his skirmishers to the right (west) to link up with Smyth’s skirmishers at Armstrong’s Mill on the north side of Hatcher’s Run. A bridge of 100 feet in length was soon built on the Vaughan Road. At that point, West’s Brigade of Mott’s Division and Roder’s Battery K, 4th U.S. were also sent across. While Mott was busy crossing to the south of Hatcher’s Run, Smyth’s Division was tasked with taking Armstrong’s Mill as his extreme left on the north side of the stream. He was to extend to the right and anchor his force on a swamp. Smyth managed this task without incident by 10 am. Adams’ 10th Massachusetts Battery was sent with Smyth to provide some support. McAllister’s Brigade of Mott’s Division was to take up the line from the swamp westward, but he didn’t have enough men to extend all the way to the swamp, so a gap of several hundred yards existed between Smyth’s right and McAllister’s left. Once Humphreys realized what was going on, around 2 in the afternoon, he asked First Division commander Nelson Miles to send a strong brigade to take over McAllister’s current position. This would allow McAllister to sidle left and fill the gap between his men and Smyth’s Division. Around the same time, Meade ordered IX Corps commander John Parke to send Hartranft’s Division (3,200 officers and men) down the Vaughan Road to act as a reserve for Humphreys. Would these reinforcements arrive in time? At 4 pm, the Confederates on the Boydton Plank road line to Humphreys’ north and northwest opened an artillery bombardment of Smyth’s position. It was clear they were getting ready to attack. At 4:30, Ramsey’s 4th Brigade, First Division, II Corps (1,100 strong) finally reached McAllister’s position, allowing him to begin the move left to the swamp. He was almost in position when the Confederate infantry attack began around 5:15. 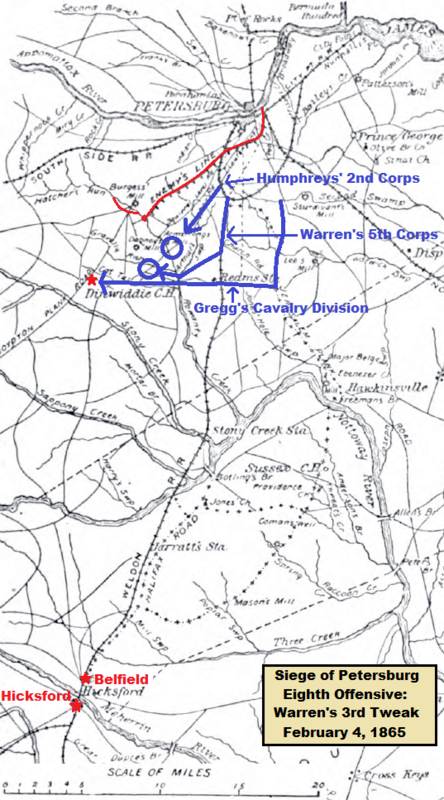 The brigades of Cooke, McRae, and McComb, all of Heth’s Division, Third Corps, Army of Northern Virginia, moved forward towards the gap which had existed between Smyth and McAllister. McAllister’s Brigade bore the brunt of this assault. Evans’ Confederate division attacked Smyth’s right. West’s Brigade was ordered north over Hatcher’s Run to provide support for McAllister’s left during the engagement. The fighting raged on until shortly after 7 pm, when the Confederates called it a day and retired. Humphreys estimated that the II Corps lost 125 men killed and wounded in this short, sharp affair. The 8th New Jersey was particularly unlucky. Caught in the open during the attack, the regiment lost 48 of the 54 casualties in McAllister’s Brigade during this fighting. In the afternoon were relieved by a portion of Brevet Brigadier-General Ramsey’s brigade, and were passed in his rear. A few minutes past 4 p.m. we moved to the left of our former position, and went into line of battle behind the extreme left of the works, with the exception of the left wing, which was without any protection and formed the left of the brigade. Before the battalion had got into position the skirmishers were driven in, and the enemy, keeping up a desultory fire, soon made their appearance. They were greeted with a terrific volley of musketry from our men, and thrown into confusion. Again they advanced in strong force, and, notwithstanding the destructive fire poured into them, succeeded in gaining the shelter of stumps and fallen timber on our left front and for a time kept up a fatal fire on the exposed wing of the battalion, but they were forced to retired. They again made their appearance, seemingly determined upon carrying the line, but the well-directed fire checked them when within eighty yards of our works; they fought for some time quite determinedly, but eventually gave way in confusion, suffering severely for their temerity. The last repulse was after dark, and was the end of the engagement. Our loss was 11 killed and 38 wounded. Pickets were established, and the night passed in quiet, the enemy making no further demonstration. 4 p.m. received orders to form on the left of General Ramsey. I at once commenced the movement; my right regiments were just filling in, when the attack was made on the picket-line. I then ordered “double-quick,” and we were moving in rapidly. Lieutenant-Colonel William of Major-General Humphreys’ staff, then informed me that there was a gap in the line between myself and Ramsey, caused by General Ramsey closing to the right; my rear regiment (the Eleventh New Jersey Volunteers, Colonel Schoonover), intended for the left of the line, was taken off and hurried into this gap. They received a fire from the enemy and returned it, causing the left of the enemy’s advancing line of battle to falter and lie down. The fire was taken up all along the line as fast as my troops were formed. The pickets in my new front having come running in without firing a shot, left the enemy right on us before I had my line completed. Regiment after regiment opened on the rebels as fast as they wheeled into position, causing their line to halt and lie down. The left regiment, the Eighth New Jersey Volunteers, under command of Major Hartford, or the left wing of it, had no works, and were exposed to a terrible fire in this unprotected position, but they stood nobly and fought splendidly, not a man of this regiment, or indeed of the whole brigade, left for the rear. Major Hartford and his regiment deserve particular credit for the gallantry displayed in getting into position under the severe fire and holding it without works, while two regiments from the Second Division that had been lying for hours a little to my left, on the approach of the enemy gave way without firing a gun, leaving much larger space without troops between my left and the right of the Second Division. After the fighting on Humphreys’ front ended, George Meade was painfully aware that the Confederates would do everything they could the next day to find a seam in the newly extended Union lines. He did everything he could on the night of February 5 to prevent that from happening. The divisions of Hartranft (IX Corps) and Wheaton (VI Corps) were called to fill the gap between Fort Cummings on the permanent Union line of fortifications and Humphreys’ right, digging in as best they could. Warren would take his V Corps and Gregg’s Cavalry northeast up the Vaughan Road to take over for Mott’s men south of Hatcher’s Run. Gregg would cover the far left flank and make sure no Confederates made it into the Union rear. The gaps closed, Meade could now focus on taking advantage of any Confederate movements made outside of their works. He was determined to catch them without the protection of their trenches and punish them if possible.